Designed for a 2 to 4 person party. 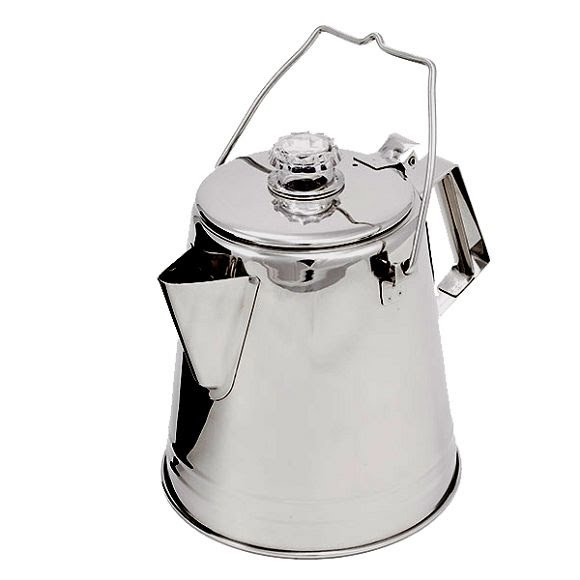 Stainless steel stands the tests of time in the most abusive of situations and it just stands to reason that it should be applied to a coffee percolator. The combination creates a seamless coffee percolator that is easy to wash, maintains the same taste and is durable. The hinged lid and flame resistant handle makes for handy handling and great coffee-making. Designed for a 2 to 4 person party. Stainless steel stands the tests of time in the most abusive of situations and it just stands to reason that it should be applied to a coffee percolator. The combination creates a seamless coffee percolator that is easy to wash, maintains the same taste and is durable. The hinged lid and flame resistant handle makes for handy handling and great coffee-making. This is a quality GSI Outdoors buy for any campers that need coffee in the morning. Dimensions (packed) 8.5" x 6.5" x 7.8"